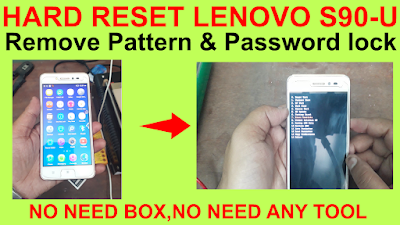 Hard Reset Lenovo S90-u Remove Pattern & password lock. How To Hard Reset Lenovo S90-u Method. 2# Click power buttion & shutdown your phone. 3# Now click power buttion & volum down buttion few sec. 4# Now show recovery mode open. 5# Go to 7 step. 8# Few min watting your phone user data erasre process. 9# Now your phone pattern,pin,private lock remove complite.